In The Public Service, Who Else Does All This? The pictures are in support of our local president Ryan Dewey who received a 40 hour suspension. Photos d’une action devant l’établissement Fenbrook, en soutien au président local Ryan Dewey qui a écopé d’une suspension de 40 heures. The pictures are in support of our local president Ryan Dewey who received a 40 hour suspension. Photos d'une action devant l'établissement Fenbrook, en soutien au président local Ryan Dewey qui a écopé d'une suspension de 40 heures. MIRAMICHI, NB, Aug. 18, 2016 /CNW Telbec/ - Numerous members of the Union of Canadian Correctional Officers (UCCO-SACC-CSN) are demonstrating today in front of the Public Service Pay Centre in Miramichi. They are calling for the federal Government to settle - once and for all - the issues that have been plaguing centralization of pay services since 2014 and problems that have exploded with the introduction of the Phoenix software in February 2016. Much like tens of thousands of other Canadian Public Service employees, several correctional officers have been victims of the failures of the new Phoenix software pay system. The problems are multiple: employees have been deprived of pay, reports of records of employment being issued that have prevented obtaining various benefits, non-payment of bonuses or allowances, grading errors, erroneous tax rates, etc. For some of these employees, the amounts owed by the Government are considerable, which generates not only financial problems, but also significant stress. Pressure applied by UCCO-SACC-CSN and other public service unions over past months has forced the Government to open a satellite office in Gatineau and to hire 100 additional people to work there. But, for now, results are not forthcoming and the many problems remain. "Our members cannot take this any longer. They no longer wish to hear justifications from Minister Foote. The Government must assume its responsibilities and pay its employees, period," said Jason Godin, UCCO-SACC-CSN President. By appearing before the Miramichi offices, correctional officers also wish to demonstrate their solidarity with the workers of the Public Service Pay Centre who find themselves, involuntarily, in the middle of this huge mess, and who, furthermore, are also experiencing the same pay problems. Mr. Godin has told them, on behalf of all UCCO-SACC-CSN members, "we want our message to be clear: our action today is targeting the political leaders of this bungling. They are the people who must double their efforts and not the Centre's employees''. 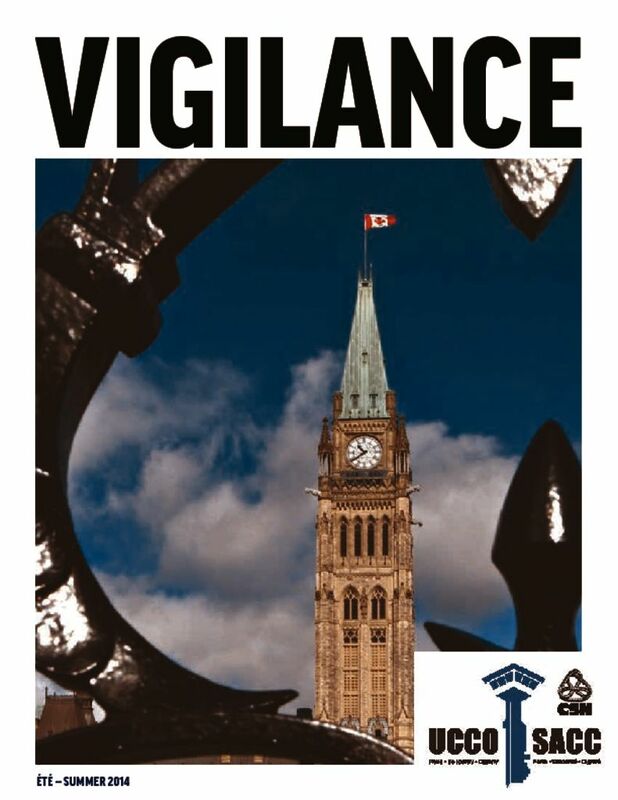 In support of this event, correctional officers across the country are wearing a badge today in support of their claim, on which is written: 'Enough! Pay us'. "We'll display the badge in all Canadian correctional institutions, and we are all united in this fight to receive our pay. We will continue to hold government accountable at all levels", concluded Mr. Godin.